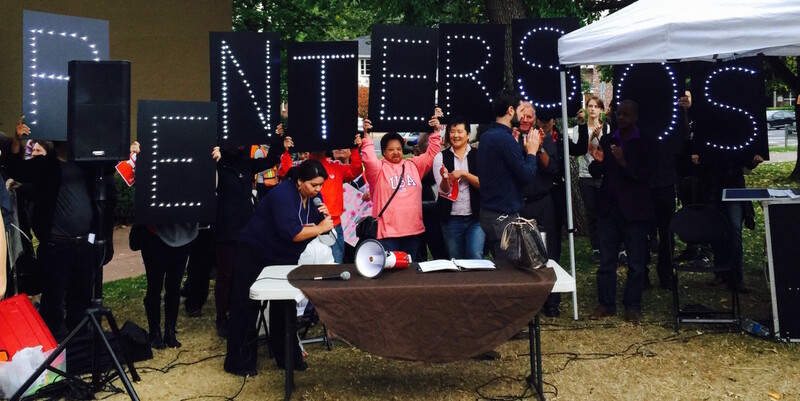 Housing activists at a Community Alliance of Tenants press conference in Portland earlier this fall. Reporting on the new reign of cash in the Portland housing market, as investors buy thousands of homes and homebuyers and renters alike face pressure from a new kind of speculation. These are by no means the only organizations providing services and ideas to housing affordability discussion in Portland. They are, however, key players in an active discussion about policy and financial solutions to housing equity. This list is a work in progess. Let us know in the comments below what we should add. A Home For Everyone is a coalition that pools the resources of the cities of Portland and Gresham with Multnomah County Resources and those of the social service organization Home Forward, with funding from Meyer Memorial Trust. City Club of Portland, the nonprofit public affairs organization, is currently heading an Affordable Housing Research Committee and organizing events and discussion around Portland housing equity. Home Forward partners with Portland, Gresham, and Multnomah County to house homeless residents. Legal Aid Services of Oregon is a nonprofit legal center that provides legal services to low-income clients, including on housing issues. Its guide to housing issues is a great resource for understanding basic housing rights in Oregon. Metropolitan Alliance for Common Good (MACG) is an alliance of faith-based organizations dedicated to civic leadership for the common good. MACG recently called on the Portland City Council to boost the percentage of tax increment financing set aside for affordable housing from 30 to 50 percent in Portland’s urban renewal areas. The ask was an outgrowth of recent listening sessions in which MACG found lack of affordable housing to be a dominant concern among constituents of its member institutions. The Oregon Housing Alliance is a coalition of 67 organizations including a number of statewide organizations. It represents most of nonprofit advocacy housing community that is interested in housing, including nonprofit developers, people that provide services to those who need housing, Street Roots, JOIN, even social service organizations that see the link between housing cost and increasing demand for other services, like the Oregon Food Bank. The Housing Alliance looks across the spectrum at issues affecting people experiencing homelessness, subsidy issues, home ownership access and other issues affecting housing, such as foreclosure. It is one of the leading advocacy voices on housing issues in Salem. Oregon Housing and Community Services provides housing programs to remedy homelessness, instasbility, affordable rent, and affordable home ownership. It’s a state deparatment, with resources ranging from case management and emergency rent assistance to access to federal and state funds for energy assistance and weatherization and loans. OHCS will have a stronger voice in the policy fray in the next biennium, during which time it will be tasked with administering $62.5 million in new housing dollars. Because the money is comes from a general obligation bond repayed by the state, it comes without the typical restrictions of the federal money that dominates affordable housing, an opportunity to reimagine solutions. Oregon Law Center provides free legal aid to low-income clients. The organization counts shelter as among the critical needs its attorneys aim to secure fair access to. Oregon Opportunity Network (Oregon ON) is a statewide coalition of more than 50 voting members that are active providers of support services to low income people. The organization provides support to affordable housing and community development by doing advocacy and policy work. Oregon ON works with the Oregon Housing and Community Services to help the state department develop good policies and distribute its funds accordingly. It also works with the state legislature – at times partnering with the Oregon Housing Alliance to promote affordable housing policy. And they are managing the community outreach aspect of Metro’s equitable housing initiative by helping jurisidictions adopt affordable housing strategies. Portland Chronicle is an online website that reports on development — specifically the pace of demolition of Portland’s older housing stock and the fate of many of these developments. The site maintains an updated and very sobering map of demolitions. Portland Renters Unite is a newly organized tenants union, which has absorbed many of the Portland Renters’ Assemblies community formerly galvanized by KBOO. This is a direct-action union intended to augment the policy positions and ambitions of the Community Alliance of Tenants. You can find the group on Facebook, lately taking inventory of available skills among its many volunteers. Portland Housing Bureau is the city’s lead on housing issues in Portland, and speficially on housing affordability and equity, promoting home ownership and development of regulated affordable housing. Led by Commissioner Dan Saltzman, it has recently authored two studies looking closely at the State of Portland Housing, highlighting policy solutions. The bureau also leads a citizen committee on housing affordability. Proud Ground administers municipal funding to create permanently affordable homeownership opportunities for middle-income households. It is led by former Multnomah County Chair Diane Linn. Right to the City Alliance is a national organization that emerged in 2007 in response to gentrification and the displacement of homeless people, people of color, and other marginalized communities. Among other things, the group is organizing to fight Wall Street landlords and helps to galvanize Renters Assemblies. Oregon’s investments in Blackstone were authorized by the Oregon Investment Council, the six-member council that approves PERS investments for the Oregon State Treasury. I would hope with all these various organizations and with $62 000000 to spend some actual affordable housing is actually built !! Does Habitat for Humanity count?